So far in this series, we’ve talked about what Home and Life Organized is all about, looked at how to choose a planner that will fit your needs, and discussed what the purpose of a home management binder is. Today we’re diving into the fun stuff with the first printable set. There is no right or wrong way to set up a home management binder: everyone will have their own way of doing it. I like to start with what I term the basics and build mine out from there. 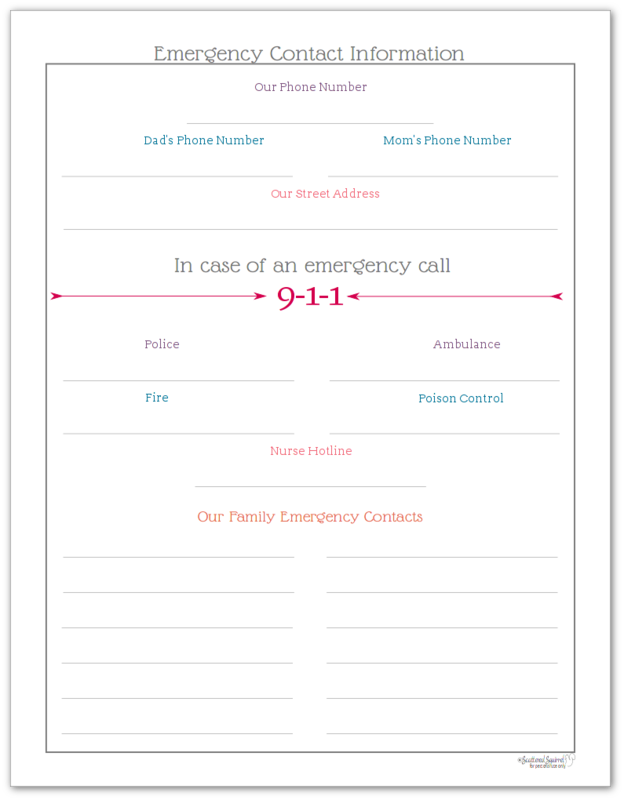 The very first pages in my system are always the emergency contacts page followed by the useful home-related information sheets. 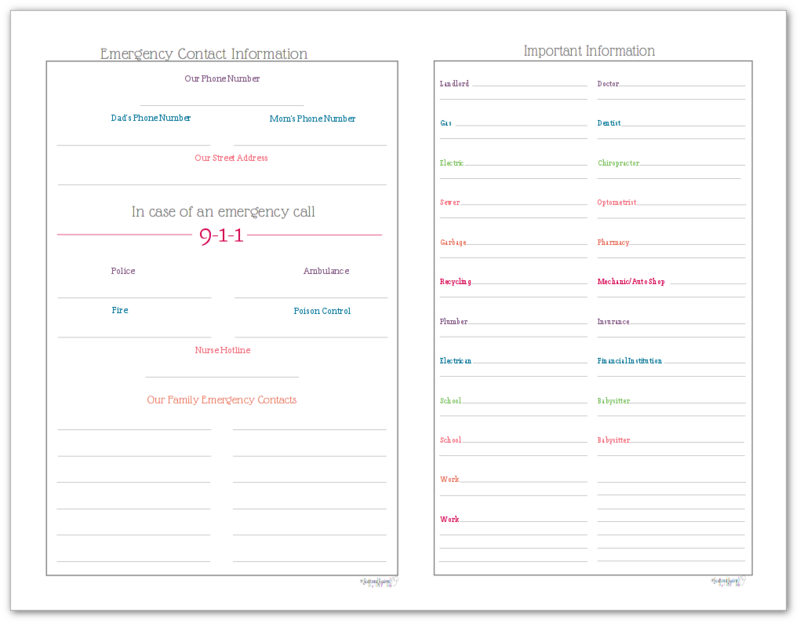 The first printable you’ll see below is the very first page of my home management binder – my emergency contacts printable. The only time it changes is if we move or someone changes their phone number. If there is an emergency, any family member can open the book and quickly see the information they might need, including our home address. I first created this page when our youngest was much younger. I wanted enough room to write nice and clear so it was easy for him to read. Now that he’s older, I contemplated shrinking the page a little. Maybe adding in spaces for other important phone numbers at the bottom, but I feel it better serves its purpose as is. The information is easy to find quickly which is what really matters in an emergency. To grab a copy for yourself, you just need to click the pictures of the ones you want and the pdf or download window will open in your browser. 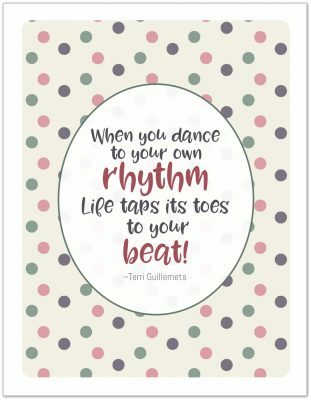 The next two printables are pretty much the same except for the first slot. One is for homeowners, the other is for renters. Theses pages were designed to keep all the important phone numbers you might need for things home-related. 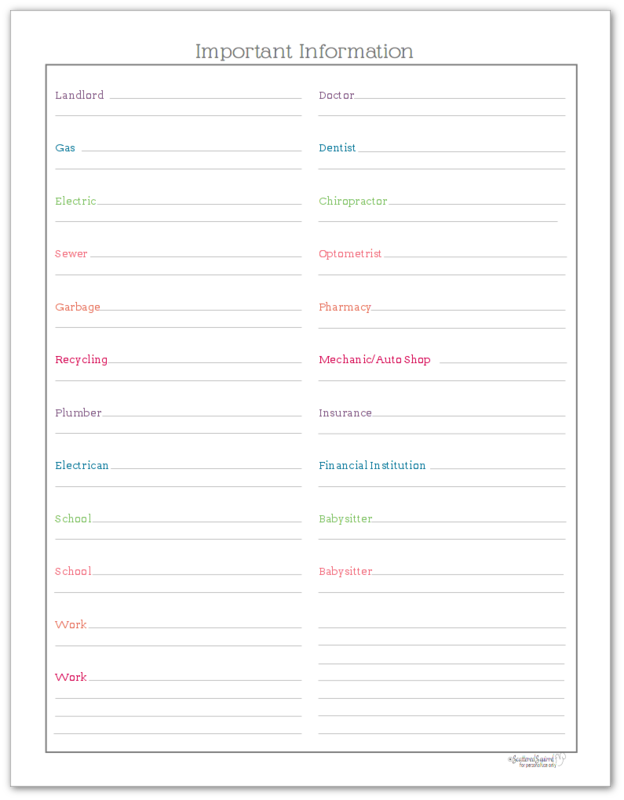 Everything from your utility companies to your babysitters. I realize with smartphones most people have these numbers stored in their phones, but I like having a copy in my home notebook too. This way, if I’m not at home, other family members have access to the numbers too. The one above is for homeowners; the one below for renters. Any account that you think belongs here. I use this mainly for our utilities and insurance. As I mentioned on day 2, one of the reasons I have a home management binder is in case there is an emergency and someone needs to step in to help out with the house and the kids. The information they might need to keep things running is found in this book, that might include needing the information to pay the bills. 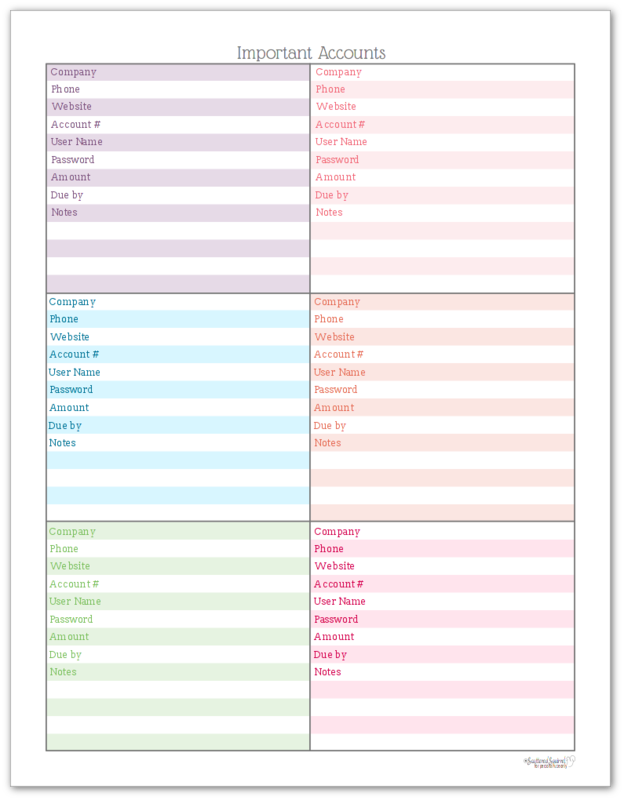 One of the biggest updates to the home management printables is that they are all being converted into half-size. I know many of you have been waiting for them, and now your wait is over. I won’t go over them all again, but each one is found below. 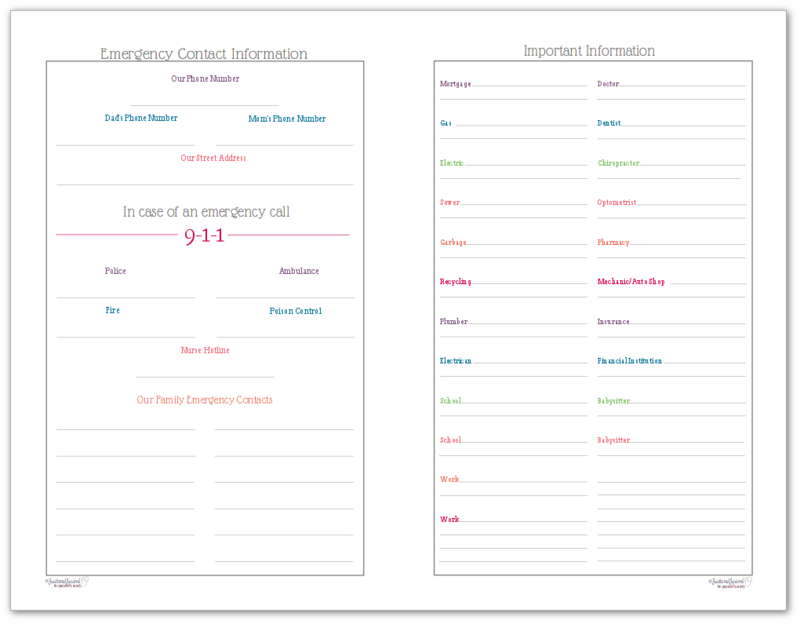 The emergency contacts printable has been paired with important information printables, so make you sure you click the one that suits your needs. 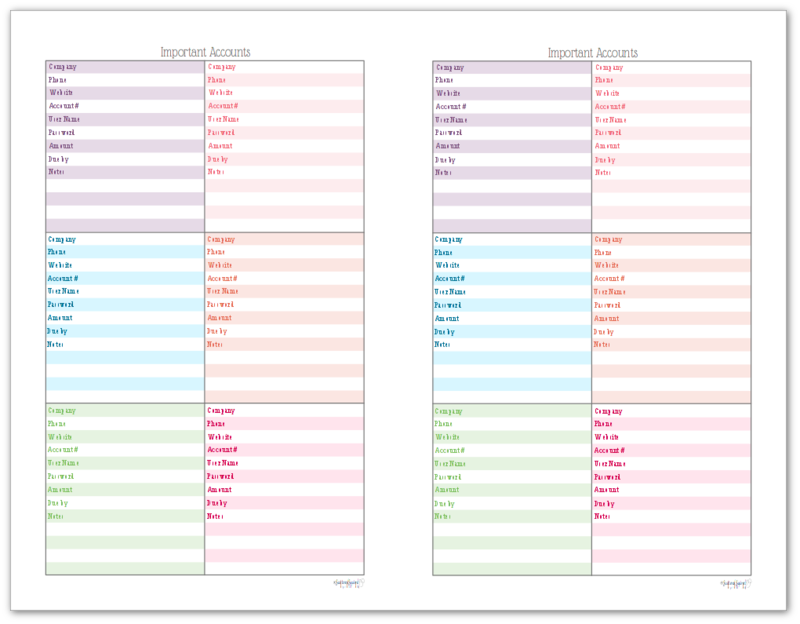 For the important accounts printable I put two of them on the page. This way you can print them double -sided if you need to. For both of these printables, I printed them singled sided and plan to just fold them in half (might even glue them back to back) before punching and putting them into my planner. This makes them a little more sturdy, and since these are pages that don’t change often, the sturdier they are, the better they hold up over time. 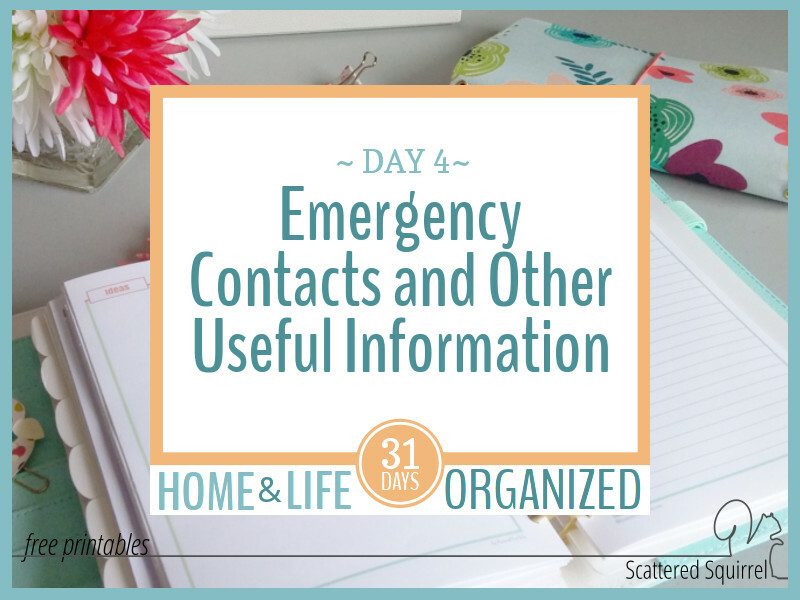 Whether you put together a home management binder/notebook/system or not, having your emergency contacts and other important information in a place that is easily accessible can come in really handy. I know we don’t like to think about bad things happening, but it really is important to be prepared for whatever life may throw our way. What do you think? Drop me a line in the comments below and share your thoughts. And don’t forget, if you have any questions don’t hesitate to post them on the Facebook post. I’m planning my first Live Video for this coming weekend – so ask away! Previous Post: « What is the Purpose of a Home Management Binder?